Joe Torres has the details on the heroic rescue. 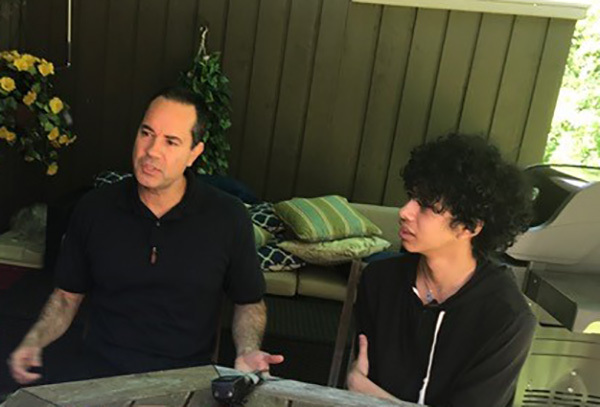 SOMERS, N.Y. -- A man who recently lost a son in a drowning last month teamed up with his other son to save an elderly woman who was struggling in a pond in Westchester County. The victim was 87-year-old Holocaust survivor Lola Margulies, who was feeding ducks at the pond in Somers when she was startled by some geese. "The ducks were here and the geese were here, and the geese were moving in quickly," she said. "I was trying to avoid them. That's when I lost my balance and fell." She fell into the pond and couldn't get out on her own. "I was screaming, 'help, help,'" she said. Fifteen-year-old Brendan Capelli and his dad Brett heard her cries for help and sprang into action. The teen jumped over a porch handrail and ran to the water's edge. "She was like, 'Oh my God, I'm dying, I'm dying, someone help me,'" Brendan said. "And then I said, 'Give me your hand.' And then she finally did, and I pulled her closer to me." The father-son team believe they weren't alone during the water rescue. Just last month, Brett Capelli's 19-year-old son drowned in a Columbia County creek. A small wooden urn around Capelli's neck holds his son's remains. "It was just a relief, and I really believe that he was involved," Brett said. "My son always helped people, and I think he still is." "Endless thank yous," she said. "Thank you, thank you, to everyone who was there to help me." Still, she doesn't think she'll continue her daily routine of feeding the ducks. "No, never again," she said. "Because I don't want to risk falling in again."